D'oyly John was brought up in Durban, South Africa. His full name was Cecil Rochfort D'oyly John, although he signed his paintings as Doyly-John. Little is known of his early life and the mystery of his parentage is deepened by the artist himself, who claimed to be the illegitimate son of Augustus John. 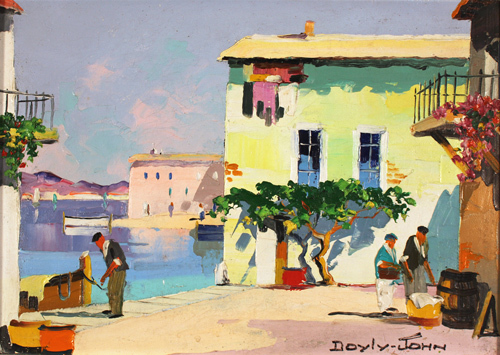 D'oyly John became a widely recognised painter for several decades after World War II with his idealised sun-drenched views of a perfect and unspoilt south of France and the Mediterranean. Read the full Doyly John biography.